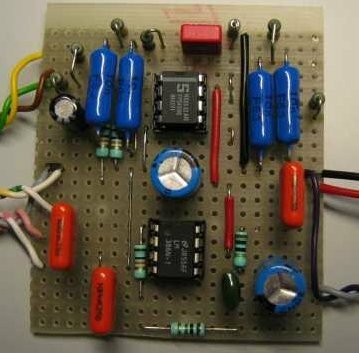 The Rock-Mite is a crystal controlled transceiver kit designed and sold by Small Wonder Labs. I've chosen the 20 meter version and equipped it with a variable x-tal oscillator (VXO). This facility offers a tuning range of 10 kHz (14.052 - 14.062 MHz). 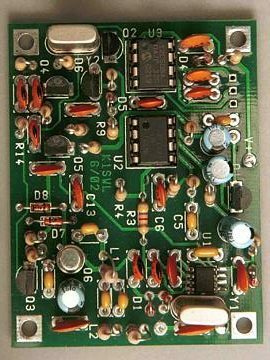 The RF output is 500 mW. The receiver is a direct-conversion type, which means that all selectivity is at audio frequencies. I have added a 2-stage audio filter (circuit diagram by KD1JV - you can find it here at the buttom of the page) to enhance selectivity. The finished audio filter can be seen in the photo below. The Rock-Mite (factory photo). The KD1JV audio filter. The Rock-Mite files it a useful homepage for Rock-Mite info and ideas. The Rock-Mite even has its own Yahoo group. I substituted the default keyer IC with a PicoKeyer-RM, which is an electronic keyer with two message memories containing each 100 characters. The following table lists the QSOs that I've made with the Rock-Mite. My antenna was a 43 m horizontal loop (loop skywire antenna) as described on this page.